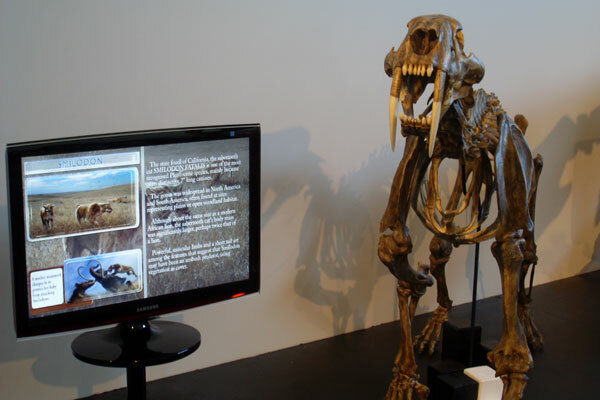 A smilodon, or sabretoothed cat, on display at the Fossil Discovery Center in Chowchilla, California. The sabretoothed cat is the official state fossil of California. Several of specimens have been found at the site. Last week, the Fossil Discovery Center of Madera County celebrated its grand opening, coinciding with National Fossil Day (Oct. 13). The Discovery Center is across the street from the largest deposit of fossils on the West Coast. To date, 15,000 fossils have been recovered from the Fairmead site, with twenty more years of active digging planned. It all started with a planned two week survey, but when a fossil was found by crews digging at the landfill, it eventually turned into a 17 year scientific find, with numerous animals found on site. The Discovery center showcases many of those findings.